More than 60, 000 unaccompanied minors, kids under 18, were being held in detention centers across the southwest. Their families had sent them, alone, to cross the border into the United States in hopes that they would be allowed to stay and seek out a better life. But despite their age, they were entering the United States illegally and many would be sent back after their long and expensive journey. Channel One News traveled to Honduras to find out why families would be willing to take this risk. For photos from Tom and Demetrius’ trip to Honduras, and a look at day-to-day life there, check out the slideshow below. 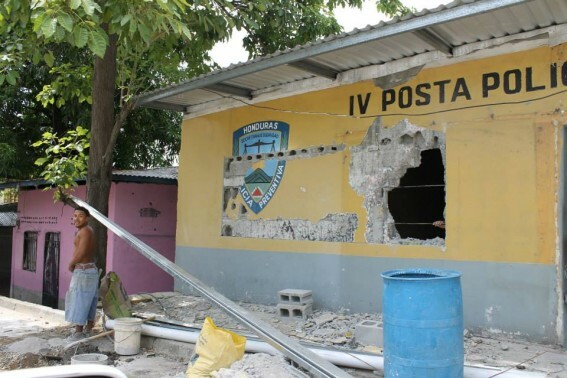 Pretty telling of the state of the Honduran Police Department. 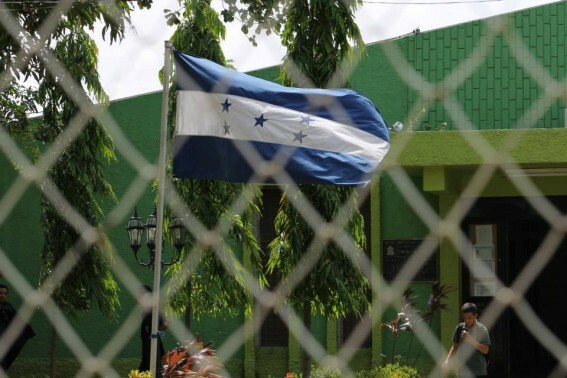 This is one of the police stations in San Pedro Sula. It’s literally falling apart. 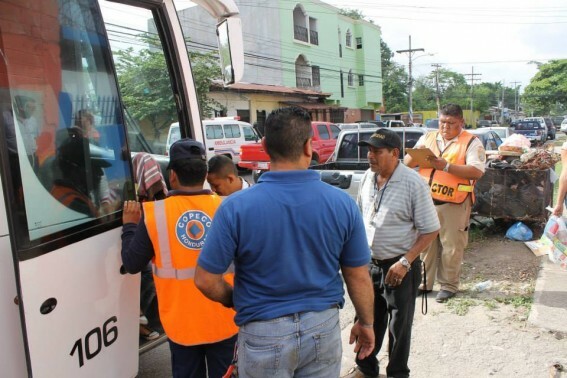 A bus full of young people arrives at a reprocessing center in San Pedro Sula. 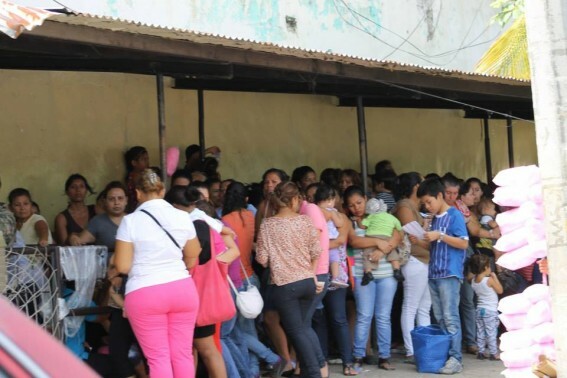 Hundreds are being sent back to Honduras while trying to get into the United States. 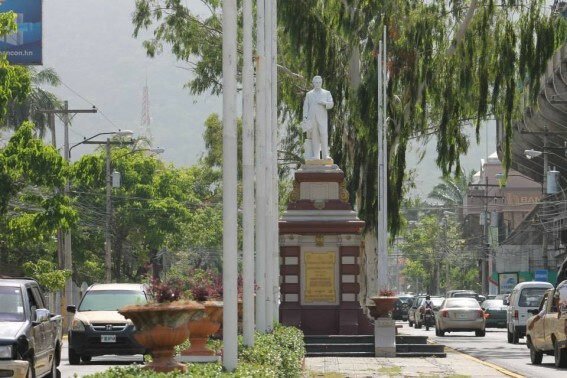 The center of San Pedro Sula, the second largest city in Honduras. It’s also known as the murder capital of the world. With the current homicide rate, every Honduran there has a one in nine chance of being murdered. It's five stars stand for the five Central America provinces back in the mid-1800s: El Salvador, Costa Rica, Guatemala, Nicaragua, and Honduras. And the two blue bands represent the Pacific Ocean to the West, and the Caribbean Sea to the East. 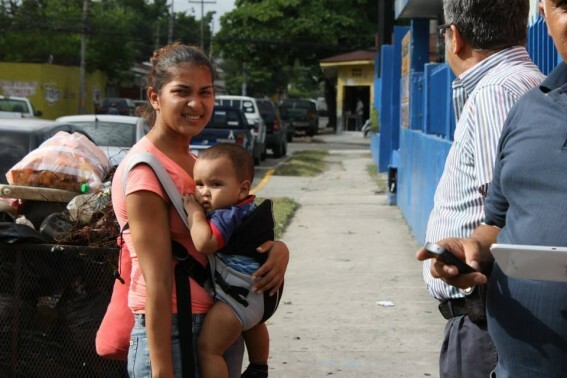 A typical day outside of a prison in Honduras. Family and friends gather to visit their loved ones in jail. It may seem like putting gangsters away is a way to crack down on crime. But actually, many of the murders come from orders given by gangsters in the prison system. A mother, 20, and her baby, just a few months old, wait for a ride home after being deported from Mexico. They were trying to seek a better life in the US, but now they find themselves back at square-one: the violent streets they tried to flee. When I asked the mother if she was willing to try to get to the US again, she said no. 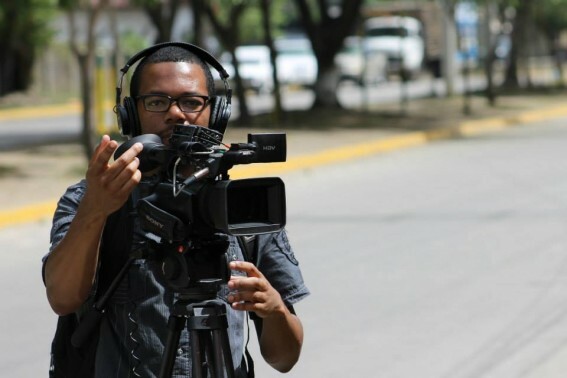 Expert producer Demetrius Pipkin getting footage outside a school in San Pedro Sula. Most of the people showing up at the US/Mexico border are in high school. 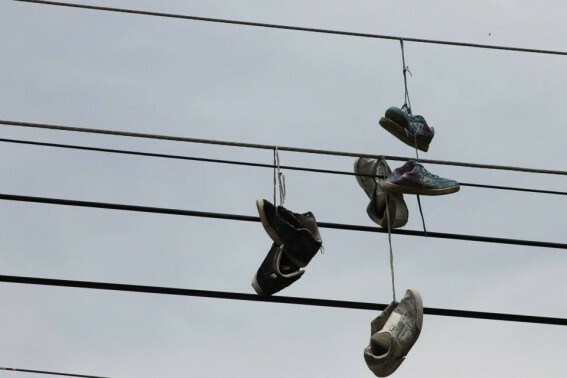 Shoes hang from a power line in the heart of San Pedro Sula. A woman shields herself from the cameras as she arrives at INFHA, a facility used to reprocess deportees from the US and other parts of Central America. So they are from another country they should be able to come to a free country. We should send them back. You have to have the correct paperwork. What about the other immigrants that had to fill out the paperwork to get here. They probably feel bad because we are letting in people who are coming here without permission. p.s. Shouldn’t there government help them. I think the young people should be allow to stay in America as refugees because the dangers that they face in their homeland are serious and deadly and until we find a way to secure their safety they should be allowed to seek shelter in the arms of lady liberty. Yes, because the people want a good life. If your Mexican and get arrested then you will be sent back to mexico because they don’t have papers. So it think and know that other people should be able to cross the United States. Illegally. Just like Africans american they had to do what the law said or else they will get arrest. Same for getting caught that you sneaked pass the border. The law is putting children, young adults, parents, adults at risk including babies. How do we know if these immigrants wont just become street rats and join the gangs here? Also how will all these kids pay for living expenses, with our tax money and how many of them will actually be beneficial to our country? They’ll just put us more into debt and where is the government of there countries? I think that they should be able to come up. Down there, they are being treated horribly. To be able to live, you need food. To have food you need money. To have money, you need a job. To have a job, you need education. Basically if these kids don’t come here, they won’t get education and they could have a hard time even living. Hey put your self in there shoes someone threatened to kill you they killed your mom and dad and you had no place to go . You would want to be safe right ? So I say go to America it is a safe country I have an unlikely chance of being killed there so it’s worth trying if I stay . So I say they should stay! I think us, United States, should help them get a better life here in the USA because they are looking for a life, but where they live, they don’t have one! We should maybe build more schools for them! I don’t think that they should send them back. There are many of Adults who would take in those kids in and care for them. Also, I don’t see why the president would send them back if they could get killed there, that’s just cruel. I think that if they’re already over here then they should stay. I think it’s extremely unfair to make them go back home to an awful place, I mean just imagine the long painful gross trip over here, and then having to go all the way back and get bullied and live an awful life. I vote that they should stay! I think funding to increase the amount of immigration isn’t “throwing money at the problem” or “irresponisible” like Boehner says. I think neglecting to do so is irresponsible. There is not a full proof method to protect the border, and until there is, there is no excuse not to direct funding for immigration issues to where it would prove most successful: in this case, assisting the immigrants. put your self in there shoes! We think it just depends if they know when they get back they are going to get killed then they should be able to stay, but they should be more strict about if they get to stay or not.